Tuesday 22nd June 2010. After a lazy start we fuelled up and hit the road around 10.30AM. Leaving Alice Springs we detoured into the Old Telegraph Station on the northern edge of the city. This place is worth a visit but I do not know about the $8.00 admission fee to get into the station itself. The old telegraph station is on the banks of the Todd River where there is a waterhole that was thought to be a spring. It has since been found that there is a depression in the granite rock shelf that traps and holds water from the wet for a longer period than the rest of the river. This was believed to be a spring and was named Alice Spring by Surveyor William Mills after Mrs Alice Todd. The Old Telegraph station is also the track head for the Larapinta Trail for people starting from the Alice Springs end of the track. For us it was the end of the track. Just over from the track head a mother and Joey Wallaroo were sunbaking on a rock but decided to move while we were there. Wallaroos are more common in this area than Kangaroos. Not long after leaving Alice Springs we crossed the tropic of Capricorn. We were now officially in the Tropics. Our next stop was a station property called Aileron which has a service station, store, motel and caravan park. 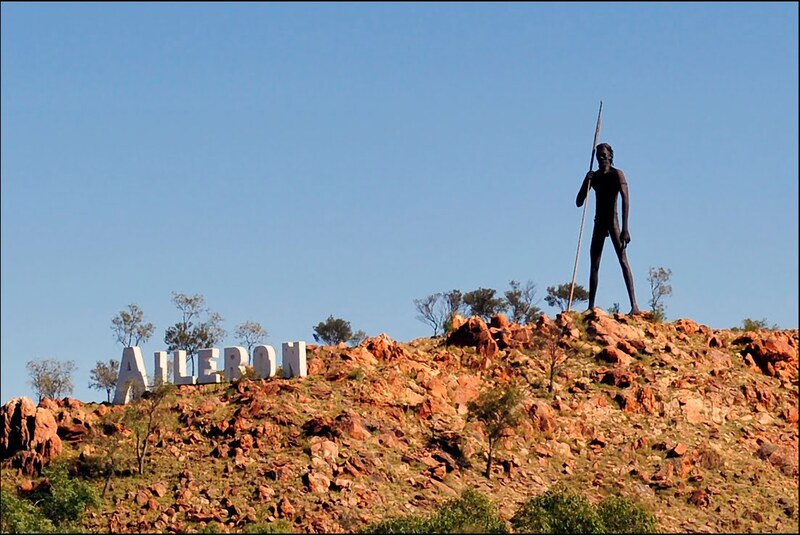 It also has an Aboriginal shop where they sell artefacts and paintings done by the Anmatjere People of the area. As we approached the settlement, we observed a giant statue of an Aboriginal man with a spear standing on the top of a hill behind the settlement. We found out that this statue is 17 metres high. 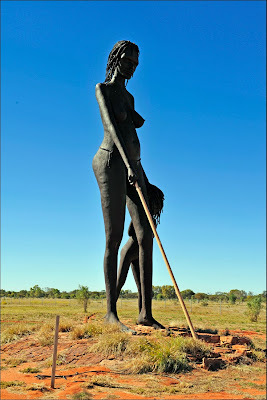 At the Craft shop there was another sculpture of an Aboriginal Woman and child. The woman would have been around 8 metres high and the child around three metres high. They had been all done by the same artist and were very good sculptures. Inside the craft centre aboriginal people were painting in their own art style. Leaving Aileron we came across a plague of Grass hoppers. Several Brown Falcons were in the trees along this stretch of road as grass hoppers are part of their staple diet. Also Black and Whistling Kites were plentiful floating on the air currents above the road waiting for the cars to disturb the grasshoppers. Around 4.00pm we stopped travelling for the day and set up our bush camp around 40 kilometres south of Barrow Creek on a track into a windmill. Because of the water from the windmill, birds were plentiful. Occasionally the wind would come up and the windmill would come to life with a groaning and squeaking sound. There were several interesting things in this area including giant ants that made their nest in the ground and decorated the edge of the nest entrance with dried needle leaves from one of the trees growing in the area. Large Powder Puff Fungi were also breaking through the ground crust and were plentiful. This had probably been caused by recent rains. Wednesday Morning we set off again with a short day planned and a drive of around 150 kilometres to The Devil’s Marbles. I stopped to photograph some old vehicles from the past along the way at Wycliff Wells. We arrived at the Devil’s Marbles for lunch and set up our caravan in the camping area. 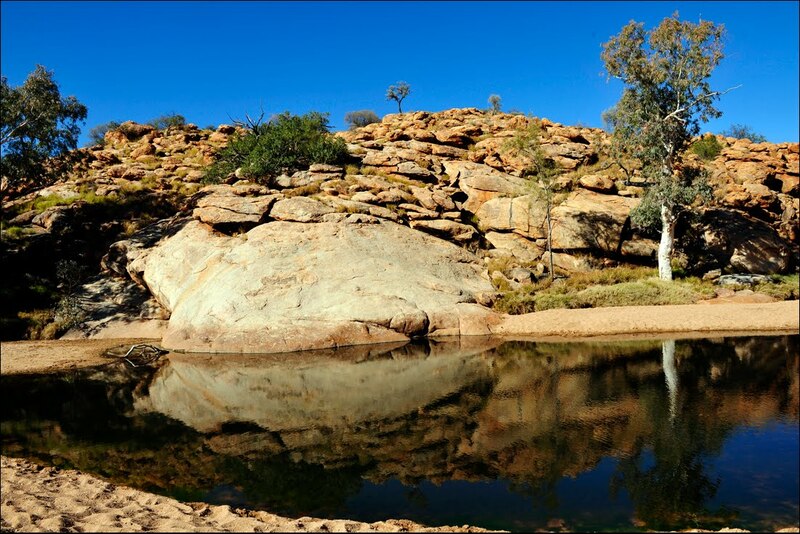 Camping fees in the NT Parks and reserves is very reasonable at $3.30 / person / night or if they have hot showers they are $6.60 / person / night. The afternoon was spent exploring the area and finding the best spot to take my sunset photos from. We were now back in the tropics and were happy that the warm weather was with us once again. First light at the Devil's Marbles before sunrise. That big fellah could have covered some country in a hurry. Keep an eye out....you might find Kevin Rudd taking a break out there. Stay safe. I was a bushwalker with the Watagan Wanderers and taught Abseiling and Canyoning. I organised and led many Canyon Trips which involved abseiling. I also organised many at home and overseas backpacking and hiking trips to Tasmania, New Zealand, North America, South America, Antartica, South and East Africa and China. Nowdays I travel Australia photographing birds and wildlife in their natural enviroment.